The linear abstract paintings originated from cityscape drawings. They are constructed by simplifying the vertical lines of the view, occasionally moving a line slightly to create an arrangement of lines and colour that sits well for the viewer. Every colour used is meticulously mixed to be exactly right. Each painting is created from many layers of paint to create different layers of depth. From a distance they appear perfect, close up there is evidence of the freehand artist maintaining the human element amongst the linear precision. 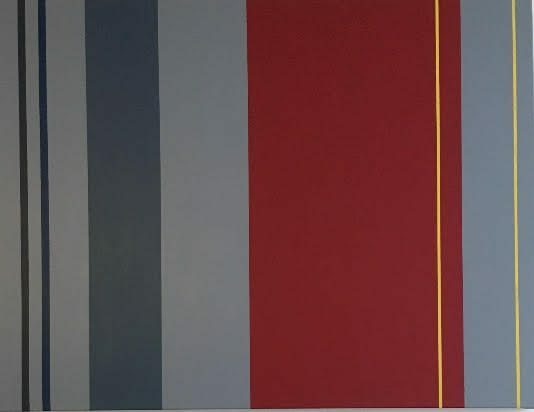 The finished piece is an abstract exploration of line, colour and space. The beautiful beaches and sea of St Ives in Cornwall are the inspiration behind many of the sea series. In contrast to the urban, geometric lines of the city that the linear abstract series originated from, the sea is an ever changing natural canvas with many changes of colour within a single day. The sea is ever changing in colour and depth and conveys a powerful sense of passing time or stillness. The sea series attempts to capture moments within the changing day of the sea and its relationship with the sky.